When I was twenty five years younger than I am today my friends would rave about your recipes. Unfortunately I am one of those people who like to discover things for themselves. I ignored their solicitations and denied their attention. 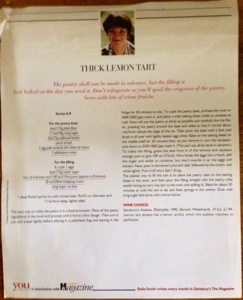 I wonder why, just at the time I needed a recipe, your easy entertaining recipe 3, Thick Lemon Tart appeared. This looseleaf recipe was published by you magazine in association with Sainsbury’s Magazine. The photo of you is credited to Peter Knab 1993. 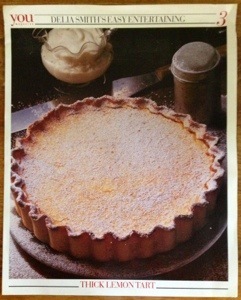 This recipe card survived the move from England to Australia in 1998, preserved between the pages of my Desserts And Puddings, Good Housekeeping Step-By-Step Cookery book. The reason for needing the recipe was to make something with frozen limes harvested last year from a potted tree in our garden. 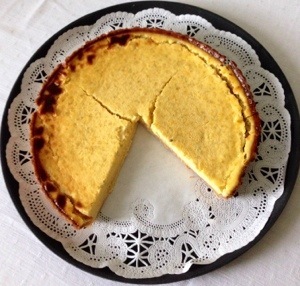 I am happy to let you know that even though my oven doesn’t have temperatures marked, size 1 eggs are not available anymore and I was using key limes instead of lemons the resulting tart was delicious. Today I’m making your Roasted Pumpkin Soup from Deliah online. I was so impressed to find that you have an online cookery school that I felt the need to recognise your philanthropic approach and introduce myself as a late blooming fan. I’m loving the lime tart idea though Robert, just love them 😉 And I laughed at your oven…ours is bad but some numbers still there ha ha !